With Perry Homes Utah’s Alpine home design, your dream of living large will surely become a reality. This rambler home boasts an expansive area that can accommodate a main floor, as well as an upper floor. On the main floor, you can find 2 bedrooms, 1.5 bathrooms, and a master bedroom that has its own master bath with a walk-in closet. This floor also features a spacious section where the kitchen, family area, laundry room and nook are located. 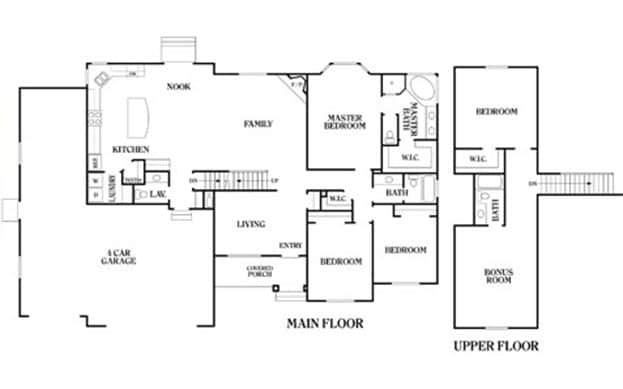 On the upper floor, you’ll find another room, a bedroom with a walk-in closet, and bathroom. Finally, you can improve the Alpine’s construction even further by including a formal home office/study in the final design. Purchasing and building a home can be a stressful experience, especially if you’re a first-time house buyer. Fortunately, Perry Homes Utah will make things easier for you, thanks to our seamless and hassle-free house buying process. From the initial meeting up until the final construction, we’ll make sure that you’re constantly updated on the progress of our project. We can even send you a downloadable copy of the plan book, so as not to interrupt your busy schedule. What’s more, you can still give us a call even after the work’s done to address any post-construction concerns. Want to learn more about our rambler and two-story homes? Then contact Perry Homes Utah today. Our design center personnel will gladly walk you through each of our high-quality yet affordable home models, as well as show you the different exterior and interior upgrades you can get for your Perry home. We can also assist you in making informed decisions about your choices, so you can get the best designs without going over your budget. What’s more, we provide transparent financing options to help you feel financially secure. Call us at 801-264-8800 and we’ll be right with you.